Doux sable blanc, palmiers bruissant dans la brise, couchers de soleil spectaculaires sur le golfe du Mexique ... Vous pouvez avoir cela et plus dans notre charmant condo en bord de mer sur la plage de Fort Myers. Joliment décorées avec des couleurs vives et des sols bois franc de chêne. Une cuisine entièrement équipée avec armoires en érable et des comptoirs en granit. Un bureau avec service Internet sans fil, et beaucoup d'espace de travail. Ce condo est une unité de fin avec de nombreuses fenêtres et une véranda wrap-around création lumineuse une belle salle de séjour. Il ya un parking privé dans le garage couvert pour cet appareil. La Riviera Club est l'un des plus beaux complexes de condos sur le côté du golfe de l'île. Il dispose d'une grande piscine chauffée avec cascade, un bain à remous, et 2 barbecues à gaz situés à l'extérieur du club-house moustiquaire. Les jardins tropicaux luxuriants et bien entretenu. Great view! Very clean! Well equipped! Beach good! Pool great ! Owner (Kay). Was extremely prompt with reply’s! Would definitely stay again! Was already booked for next year! We will try again though! The condo was lovely. Had a very homey feeling. A lot of good restaurants in the area. Absolutely loved the pool. The sunsets were beautiful and the weather was perfect. We had everything we needed at our fingertips. Would definitely recommend staying there. Kathryn was wonderful to work with. This unit had a wonderful view for being on the 2nd floor. While sitting on the beach we watched dolphins swim by and pelicans fishing. It had everything we needed for the kitchen, beach toys, beach chairs, even came with some toilet paper, trial sized shampoo, body wash and lotions, paper towel and trash bags. Only issue was the red tide was horrible when we went at the beginning of August but that is not the fault of the owners. 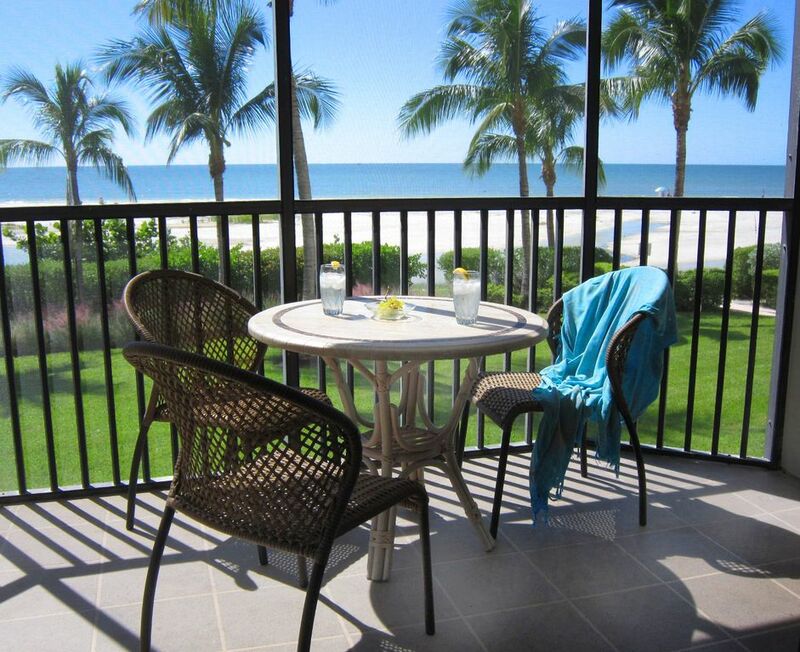 We would for sure stay here again if ever visiting Fort Myers Beach area. If you want to see alligators, go to Bird Rookery swamp, about a 45 min drive. Beautiful. 10 min drive to the times square which was full of shops, restaurants, the fishing pier and entertainment. Beautiful condo with beautiful view!! It was more than I expect, the condo was very clean and had everything we could possibly need...also It was so nice to have breakfast with an amazing view every morning! The private parking space was definetly a great plus since the car was always nice and cool when we needed to use! Also it is so nice to not need the elevator since the condo is on 1st floor but not too close to all the commotion so it was quite and peaceful!The pool was a huge hit for the kids! We loved every minute thank you so much we will definitely come back!! I am so pleased you enjoyed staying in my condo. It always makes me feel happy to know my renters like it. I love it and feel good to think others have the same feeling. And thanks so much for leaving it in such nice condition. My husband and I thoroughly enjoyed our stay in this beautiful condo. It had everything we needed and the beach location was wonderful. We would rent again...Kathryn was so easy to deal with. Definitely recommend.